The doldrums of summer are officially upon me. You know, that lame period where there are no interesting sports after the end of the NBA Playoffs and the beginning of football training camps. Mid-June through the beginning of August presents a severe sports deficiency with my Sportscenter timeline often being headlined by trade negotiations, soccer, and Wimbledon. Baseball has a couple more months before it becomes exciting. Golf is only really entertaining if Tiger is near the top of the leaderboard going into the weekend. And living in Arizona, where the temperature will be 119º today, getting outside isn’t exactly enjoyable, nor safe. Thus the doldrums of summer are upon me. With no meaningful sports to watch, talking about it is the next best thing. With my A/C tuned up and a cold lemonade by my side, I present my 2013 BYU Football Preview. The schedule presents some difficult, but winnable games for BYU, including three rematches from last season that were decided by three points or less (Utah, Boise St., and BCS N.C. game loser Notre Dame). As disappointing as going 8-5 was in 2012, there is consolation that three out of those losses were close games that could have been won, resulting in an 11-2 season. Given the strength of BYU’s schedule going into 2013, an 11-2 season would mean something pretty special. The hardest part for me is narrowing down which games I can actually manage to travel to…. At the end of the 2012 season, Head Coach Bronco Mendenhall knew that some changes had to be made. While the Cougar defense was perhaps the strongest that we’ve ever seen, finishing #3 nationally in total defense, the offense often sputtered and failed. Bronco fired Brandon Doman and brought back Robert Anae, who left BYU after running the high flying offenses of the John Beck and Max Hall eras. Anae returns after helping resurrect the Arizona Wildcats, who finished 7th in the nation in 2012 in total offense at 526.15 yard per game. As BYU ranked 60th nationally at 400.3 yards per game, Anae’s return looks to bring a faster paced offense with more passing, screens, and use of tight ends and slot backs. This week Mendenhall signed a long awaited three year contract extension, ensuring that he will be in Provo through 2016. After hearing their preseason and hiring interviews, plus reading their backgrounds, I’m most excited for Coach Tujague and Coach Holliday. Tujague should be able to quickly strengthen the offensive line that was injured and weak in 2012. While Riley Nelson was not the strongest fit at quarterback for BYU, 2012 may have been a different story had Riley been better protected and stayed healthy. Holliday, on the other hand has a great history of coaching wide receivers. With 2013 poised to be a return to high powered offensive prowess, Holliday should benefit from the return of preseason All-American Cody Hoffman, Ross Apo, JD Falslev, and Kaneakua Friel at TE. Mitch and Marcus Matthews both had very strong spring training camps for BYU, which should add additional weapons for Holliday. You can’t talk about BYU football without talking about the quarterback. Taysom Hill looks to be almost healed from the ACL tear he suffered against Utah State last year and should be 100% coming into the fall. Hill showed great promise in limited action last season. While he is a dual threat like Nelson was, Hill possesses a much stronger and more accurate arm. Throughout spring he showed off his ability to complete the long ball, while also demonstrating accuracy on his short to mid-range passes Boasting a 4.5 40-yard dash time, Hill also presents the ability to beat you at any time with his legs. Coaches have worked closely with Hill in this offseason to keep him healthy. While they encourage him to use his legs to make big plays when they are available, the emphasis has been that he needs to do a better job at sliding or running out of bounds when more than one defender is engaged with him. In games against Washington State, Hawaii, and Boise State we saw the flashes of promise from Hill that bring excitement to the quarterback position again. If Tujague’s offensive line can give him protection and keep him safe, we may be starting of another special quarterback era at BYU in Hill. 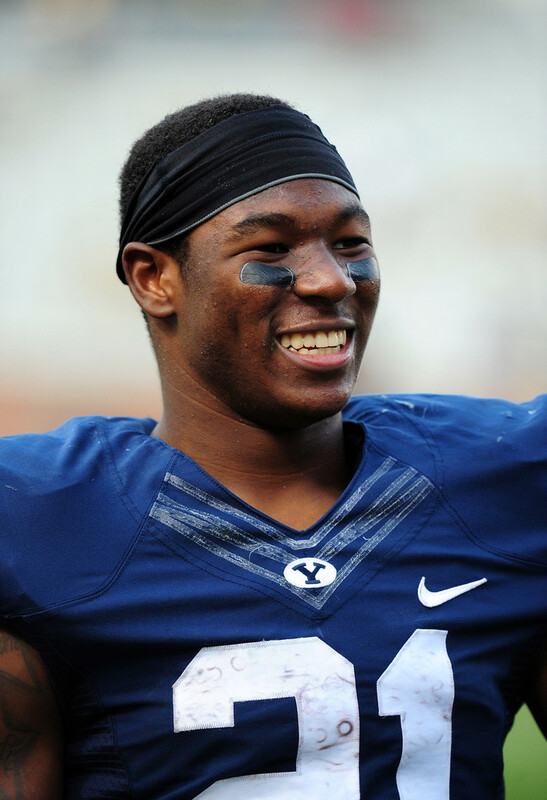 BYU will feature a two headed monster at running back in 2013 with senior Michael Alisa and sophomore Jamaal Williams. Alisa was the starter in 2012 before breaking his arm against Hawaii and missing the rest of the season. Williams stepped up admirably as a true freshman (at least we won’t have to be reminded 10 times a game by announcers this year that he is only 17 years old!) rushing for 775 yards and 12 TDs, including three 100+ yard, multi TD games. Williams brings incredibly speed, moves, and explosiveness to the team. Alisa is a larger, stronger back, similar to Harvey Unga. While he still possesses breakaway speed and explosiveness, he’s most dangerous between the tackles. After Alisa and Wlliams, also look to sophomore Adam Hine to contribute and see some playing time. Preseason All-American Cody Hoffman returns for his senior season and will anchor a strong wide receiver corp. In 2012 Hoffman caught 100 balls for 1248 yards and 11 TDs. With a healthy Taysom Hill at quarterback and Anae’s improved offensive philosophy, look for Hoffman to have an even better 2013 season and cement his place as the all time receiving leader at BYU. He’ll be joined by Ross Apo, Mitch Matthews, Marcus Matthews, and senior slot receiver JD Falslev. With the right game plan and execution, there should be plenty of passes to go around in 2013. It’s hard to duplicate the special defense that BYU put on the field last season. Senior Ziggy Ansah was selected #5 overall in the NFL Draft to the Detroit Lions. After testing the waters of the Draft, junior LB Kyle Van Noy decided to return to BYU for his senior season. Van Noy will anchor a defense that should be capable of seeing similar results to last year’s #3 overall rated defense. Even with the departures of Ansah, Brandon Ogletree, and Uona Kaveinga, the defense should still be strong. Mendenhall will look to Bronson Kaufusi (who also saw significant time on the BYU basketball team) and Eathyn Manumaleuna to sure up the defensive line. Both are strong, big, and tough lineman who should fit in nicely for the loss of Ansah and Romney Fuga. At linebacker, this is Kyle Van Noy’s team and his year to shine. A pre-season All-American, Van Noy registered 53 tackles last year, including 13 sacks and 9 tackles for loss. More important are the leadership and intangibles that Van Noy brings to the table, as displayed in the Cougar’s Poinsettia Bowl victory over San Diego State. As the offense once again struggled to the move the ball and score points, Van Noy stepped up big recording a sack/fumble recover for a TD, a blocked punt, and an INT return for TD, single-handledy outscoring both San Diego State and his own offense. He thought for a bit about leaving early and putting his name in the NFL Draft, but ultimately decided to return for his senior season. Barring injury or a complete meltdown, he should cement his legacy as one of the greatest linebackers ever to play in Provo. Van Noy will be joined by two senior LBs in Spencer Hadley and Uani Unga. While the faces may have changed, expect a similarly powerful result at linebacker in 2012. The Cougar secondary should be one of the strongest in years. In 2012, the secondary was the #10 ranked defense nationally in pass defense. The leader of the secondary will undoubtedly be senior Daniel Sorensen, who recorded 68 tackles and three INTs last season. Sorensen is fast and strong with great vision and closing speed, perfectly fit to play the SS position. He’ll be joined by Jordan Johnson (48 tackles, 15 pass breakups, 1 INT), Craig Bills (47 tackles, 5 pass breakups, 0 INT). Even with the loss of Preston Hadley, the secondary should be up to the challenge of another strong season. 2013 looks to be a season of great promise for the Cougars. The key will be starting off the season right with discipline and high energy. Starting on the road at Virginia then playing Texas at home could present a very strong 2-0 start for the Cougs going into their first bye week. That momentum could be the start of something very special going into the heart of the Cougs schedule with some tough games and some winnable games against Middle Tennessee St, Utah St, and Houston. But if the Cougs struggle out of the gate an 0-2 or 1-1 start could be the catalyst for a long season.